Part of the Tritium Series, premium line of double action pistol style airbrushes, the TG combines ease-of-use, comfort, superior detail control and the versatility of using the perfect top gravity cup size for your project. 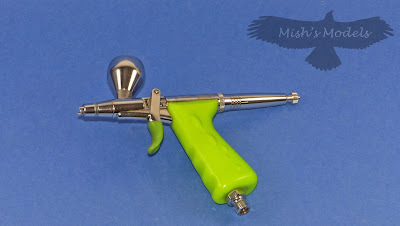 Coupled with several unique and patented features, this airbrush truly is a Grex. I have been thinking of buying a Grex airbrush for some time on the advice of some of my American modelling friends. However with no active Grex distributor in the UK, I was reluctant to order one from America. I then learnt that there was a new distributor in the UK. Whilst talking to Sean Middleton the owner of TopNotch Models about his masks he told me that he was in the process of becoming a dealer for Grex Airbrushes. I expressed my interest in buying a TG3 but wanted to try one before buying. Sean invited me to his home to try his own TG3. A mutually convenient date was arranged. Sean invited me to bring a selection of my favourite paints to try with the TG3. Sean and I spent an afternoon trying my various paints in his TG3 with a selection of nozzle and needle sets. At the end of the afternoon, I was hooked and placed an order for a TG3. A few weeks later my TG3 arrived as promised. 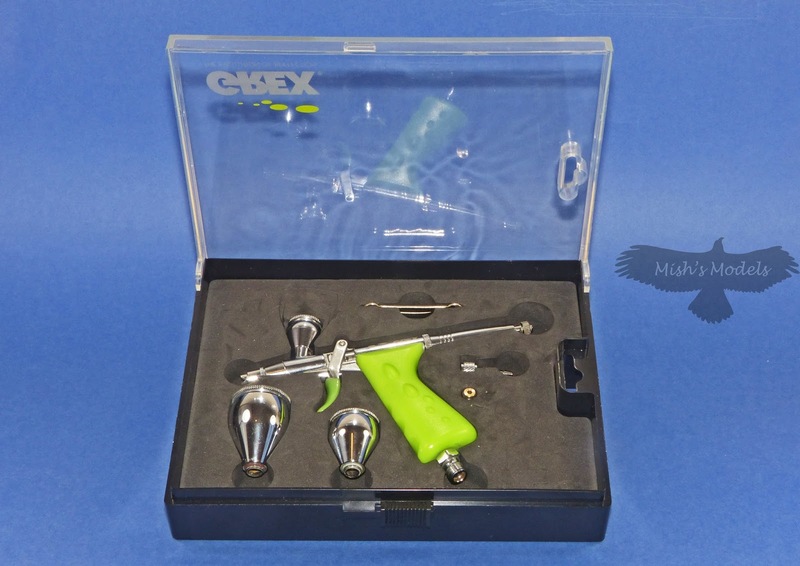 As you handled a Grex airbrush you are immediately aware of the solid build quality. They just exude quality, they are solid, smooth in action and comfortable to hold. I bet right now you are looking or even concerned about the pistol styling of the TG3 and the 'trigger' style action? Well, I was dubious at first but after a few minutes of using the airbrush, I was sold on the concept. It is more controllable and comfortable than the conventional button/lever option on most airbrushes. However, if you're not convinced you can always opt for the Grex Genesis XGi which has the more conventional button/lever arrangement. 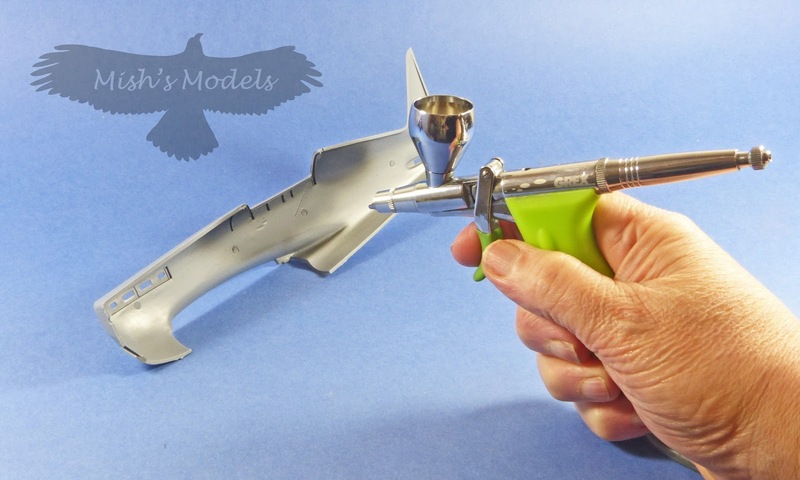 Inline top mount cups offer balanced handling of the airbrush. Three reservoirs: 2mL (1/20 oz. ), 7mL (1/4 oz.) and 15mL (1/2 oz.). Ergonomic pistol handgrip with a textured surface for a firm comfortable grip. The Grex series of airbrushes are the 'Rolls Royce' of airbrushes, and like a Rolls Royce, they are comfortable and exude class. Yes, you're going to pay a little more for a Grex but this cost will be offset by the extra life you will get. To give you some idea, in just over seven years of modelling I've already worn out two 'quality' airbrushes. I'm expecting this TG3 to outlast both of them. Anyway, it's worth that little bit extra to get an airbrush that is comfortable to hold and use, cleans easy and with its interchangeable paint cups and nozzle caps is more versatile, out of the box than any other airbrush I have come across in ten years of modelling. I would like to thank Sean of TopNotch Models to whom I am indebted for his hospitality and help in selecting and purchasing this Grex TG3.